With the exception of the moonlight-serenading Glenn Miller ghosters, there are no longer any big bands on the road these days. The young crew led by Maynard Ferguson was the last of its kind. MF’s death in 2006 represented, once and for all, the end of the traveling bands. But the big band genre’ is hardly extinct. Certainly, there are the superb college and high school jazz bands, but in the professional sector, big bands abound for recording purposes, rehearsals and local gigs. An exception of sorts to the traveling rule is the case of the Jazz at Lincoln Center Orchestra under the direction of Wynton Marsalis, which does tour from time to time on a limited basis. In the “local sector”—and “local” is not to be taken as a negative term—there is the Zeropoint Big Band based in central Pennsylvania. This talented crew has just recorded a CD, “James Witherite + 17,” featuring the arrangements, six of the nine compositions recorded, and the flugelhorn solos of Mr. Witherite himself. You’ve got to love this guy. He’s a superb improviser—who swings like the dickens–an inventive composer and arranger, and, get this, a horse racing announcer who has breathlessly described thoroughbred and harness races at more than 50 tracks throughout north America. A renaissance man, indeed. He’s been at the jazz game since childhood, studied formally at Duquesne, released his first CD as a leader, “West by Northwest,” in 2006; followed by “Live in Pittsburgh,” recorded a year later with the Duquesne University Jazz Ensemble. The new CD is just marvelous in terms of ensemble tightness, intonation and sense of swing. There are, maybe, one or two ragged edges in the brass section on a selection or two, but that only adds to the excitement and makes these guys seem human! The rhythm section, booted by drummer Kevin Lowe, is loose enough to cook but precise enough to drive the rather complex shout choruses. The short title cut, “0.67;” “Father John;” the standard “My One and Only Love” (featuring the Arthur Prysock-inspired vocals of Michael Andrews); and Duke’s “Love You Madly” (with a fine, fine vocal by Carolyn Perteete) are personal favorites. All the titles, however, are worth listening to again and again, as there’s something new to be heard on each go-round. On a personal basis, I’ve heard James Witherite several times—on piano as well as flugelhorn—and I’ll only repeat what I told him. “Whenever I get a band together,” I said to him: YOU’RE HIRED. And about the band? Take the plunge. Go on the road. For more information on James Witherite, the Zeropoint Big Band, and the CDs availability, log on to www.JamesWitherite.net and/or www.ZeroPointJazz.com. 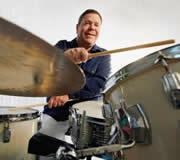 Greg Caputo is a talented, versatile and swinging drummer with credits that include everyone from Basie and James to Goodman and Shaw. His academic credentials are impeccable as well. He’s a Hartford Conservatory of Music graduate and studied privately with Alan Dawson, Joe Morello and Jim Chapin. Caputo even sat in for an ailing Gene Krupa a concert in the early 1970s. Above all, he uses his experience, credits and talents to preserve and perpetuate the big band jazz tradition. “Classic Swing with a Modern Drive” is a brand new CD by Caputo’s big band, with altoist Phi Woods and vocalist Viv Murray as special guests. Recording a straight-ahead, 16-piece big band CD in 2009? Talk about dedication. As a whole, it works beautifully. The band swings, and peerlessly tackles vintage stuff like “Sing Sing Sing” and “We’ll Git It,” as well as the complexity of Buddy Rich charts like “Nutville” and “Mexicali Nose.” Ensemble-wise, there’s not a note out of place, but under Caputo’s leadership from the drum chair, there’s nothing stiff about this. The venerable “Shiny Stockings” is the essence of relaxed swing. Certainly, the Basie feel sounds easy, and that is as it should be. It is not, however, easy to play. Solo-wise, everyone involved is a champ. Phil Woods? He’s still got it. Congratulations to Gregory Caputo for his tireless work as an educator, percussionist, bandleader, and now, recording artist. Unless one was prone to do a lot of digging, few knew that the Gene Krupa quartet made an appearance at the 1959 Newport Jazz Festival. In fact, until very recently, it was understood that Gene made only two, Newport appearances, one at the inaugural 1954 bash, and again in 1972 at what was called Newport in New York. Courtesy of an online music company named Wolfgang’s Vault, owned and operated by Bill Sagan, a good deal of previously undiscovered Newport material is coming to light, including Krupa’s 1959 appearance. Others at the fest, by the way, included the likes of Herbie Mann, Thelonious Monk, Basie and many others, and the recordings were made in pristine stereo direct from Newport stage mikes. Not all sets are complete, though we should be thrilled to have what we have. No one knows exactly who recorded this material, says a recent New York TImes piece by Ben Ratcliff, and although Voice of America’s Willis J. Conover introduces some of the acts, Ratcliff maintains that VOA could not have taped the shows, as Voice of America’s various Newport tapes were done in mono. It was suggested that record companies did the recording, but that’s hard to believe, in that around 10 different companies would have had to be involved. Krupa may have been invited that year in conjunction with the upcoming release of the film about his life, and/or to hype the release of his “Big Noise From WInnetka” LP, as well as the Krupa story soundtrack album. This version of the quartet, with pianist Ronnie Ball, bassist Jimmy Gannon and reedman Eddie Wasserman, was said to be amongst Gene’s favorites of all his small groups. Fans have had mixed opinons. The classically trained Wasserman–also one of the biggest contractors on the New York scene in the 1950s and 1960s–was fluent on flute, clarinet and tenor, and brought quite the cool sound into the band. Ronnie Ball, who studied for quite some time with Lennie Tristano, was also quite the modernist. 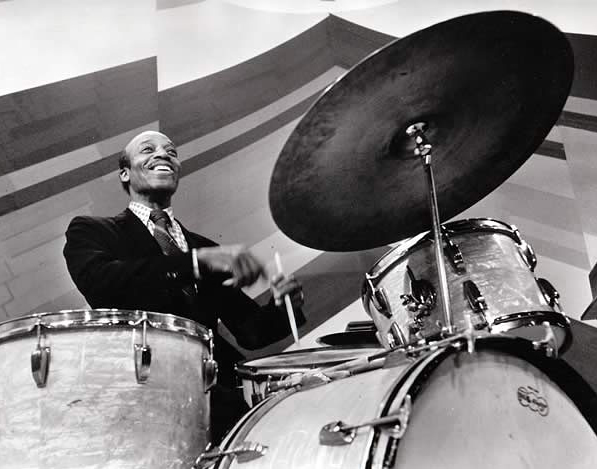 Gene made good use of Wasserman’s versatility, featuring him often on all three horns. What Wasserman didn’t have, say some fans, was the free wheeling swing of a Ventura or Eddie Shu. But it was a good group, and lasted for a good five or so years before Charlie Ventura returned to the fold circa 1963.
Who knows what else will surface in the future? Bob Karcy may not have “invented” the concept of the jazz video, but then again, when he founded V.I.E.W. Video in 1980, he was certainly the first to issue jazz concerts and other jazz-oriented filmed material on home video. Almost 10 years later, Karcy is very much at it, with an expansive catalog of jazz on DVD, as well as classical music, opera, documentaries, pop, educational films, and rare television shows. In the jazz realm, featured artists include everyone from Freddie Hubbard and Louie Bellson to Billy Cobham and a newly-discovered opus from the underrated songstress, Damita Jo. Karcy also presides over the critically acclaimed and award-winning Arkadia jazz C label. V.I.E.W. is not resting on its considerable laurels and impressive list of products. New and rare material surfaces regularly, and I urge all JazzLegends.com visitors to visit www.VIEW.com and see what this innovative, creative outfit is up to these days. Maynard Ferguson, the dynamic, musically stratospheric and charismatic bandleader/trumpter who died in August of 2006, is the subject of a new book. Not surprisingly, the work was not able to find a traditional book publisher. Maynard! was written and assembled by Grammy Award-winning record producer Ralph Jungheim, is a collection of interviews with many of Maynard’s personal and professional colleagues through the years, including reedman Lanny Morgan, Don Menza and Bud Shank; drummers Rufus Jones, Shelly Manne and Peter Erskine’ singer Irene Kral; guitarist Mundell Lowe; trumpeter Lew Tabackin; and various others. Maynard! is self-published and the good news is that it was published at all, in a day and age when traditional book retailers are going under, and the only works that seem to get traditional book deals these days are works by politicians, conservative and otherwise. Lee Mergner, Editor of Jazz Times magazine, who first wrote about this on the JazzTimes.com site, is optimistic when it comes to print publishing and jazz. He should know, as Jazz Times ceased publishing recently until, thankfully, it found another buyer and is back in business. Ferguson’s life and music are worthly of a full-fledged bio. Dr. William Lee did write an authorized biography of Maynard about ten years ago, but its scope was surprisingly limited. It lasted, in various incarnations, until the bottom dropped out of the jazz business around 1967. But MF’s band was astounding, and those a part of it during those salad days likened it to what it must have been like to be a member of The Rolling Stones. The array of talent that passed through that 12-piece group was incredible, and included artists such as Joe Zawinul, Don Ellis, Bill Chase, Slide Hampton, Jimmy Ford, Don Menza, Jake Hanna, Rufus Jones, Jaki Byard, John Bunch; and an equally wonderful array of arrangers and composers. The band recorded prolifically for Roulette. Volume-wise, they could blow groups twice the size off he stage. Subtle, it wasn’t. Swinging, it was. Call Maynard Ferguson the “Buddy Rich of the trumpet,” if you will. No one has yet been able to equal his trumpet range and the clarity of his range—no one, quite simply, could play higher—and the energy, feeling, and enthusiasm he brought to the stage was consistently infectious and exciting. By God, it’s even been said that Miles Davis liked his playing. Ferguson had become, like Harry James before him and Doc Severinson afer him, as much of a personality as a musician, though he never, ever compromised his musical vision. Times were tough in the latter 1960s for everything that was jazz, and were at a particularly low ebb for big bands. Woody was scuffling, Basie was recording Beatles’ tunes, and Ellington was surviving. Buddy Rich, however, did begin to make something of a splash on the scene around 1967, but Maynard couldn’t ignore increasing audience disinterest. He first cut down to a small group, spent some time studying and teaching in India, and ended up living in Manchester, England, circa 1969. He has no idea that a second, very successful career was in the offing, via his signing with CBS Records in England in 1969, and later forming an all-British band, with the accent on more contemporary material with a contemporary beat. Maynard came back to the states permanently in 1973 and resumed a hectic touring schedule, with the emphasis on high school and college bookings, and in-residence teaching “clinics,” a concept pioneered by Stan Kenton. The band became a favorite of younger music fans via their choice of material, and in fact, made it to the coveted “top 40” with “Gonna Fly Now,” the theme from the film, “Rocky,” in 1977. Demand for the band—as well as its prices—went up, and Maynard Ferguson was able to maintain the group, through several names and musical configurations, until just days before his death on August 23, 2006. As a person? There are only two musicians in the history of jazz that no one—no one—has ever heard a negative word about. Louie Bellson. And Maynard. The source material for Maynard! was a series of interviews recorded by author in 1978, when Ferguson and the band were playing in Santa Monica, CA. His wife transcribed the many hours of interviews. “Jungheim had hopes of getting a book deal based on the interviews,” Lee Mergner explained, but there were no takers” from the major publishing houses. Ultimately, Maynard! was released as a print-on-demand project. The 240-page paperback is now available via MaynardFerguson.com, Amazon.com and the author’s own BusterAnnMusic.com. Perhaps the entire story will someday be told.